It’s so easy and quick to make ghee in an Instant Pot (or on the stove), and it’s much more delicious than store-bought! Use your homemade ghee anywhere you’d use butter for more flavor and less lactose. I’ve been making my own ghee at home for several years now, and it may be my favorite food in the entire world (apologies to macaroni and cheese, my childhood favorite). If you’re not familiar with ghee, it’s basically clarified butter taken one delicious step further. When you cook butter and strain out the browned milk solids, the end result is a healthy, lactose-free fat that lasts almost forever and won’t burn at high temperatures the way butter does. 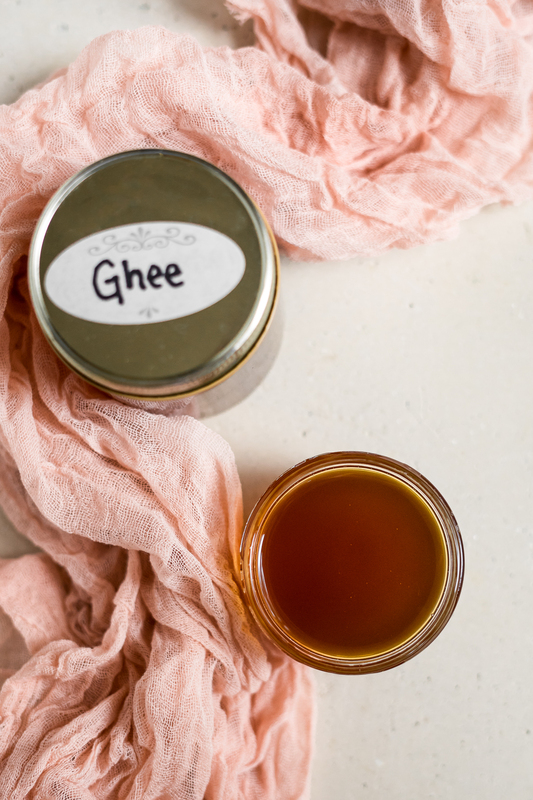 The scent of homemade ghee is one of the best smells on earth, and you’ll love using it for cooking, baking, and topping all kinds of food–pretty much anywhere you’d normally use butter, ghee can do the job better! If you don’t have an Instant Pot, never fear–it’s just as easy, albeit a little less quick, to make it in a regular pot on the stove. Grass-fed butter is best, and you definitely want to use unsalted. I almost always use Kerrygold because it has such a wonderful flavor! Cooking the butter for longer makes the ghee a darker color and gives it a richer flavor and aroma (see the photo below for a comparison of my homemade ghee with store-bought ghee!). I like to wait until the milk solids at the bottom of the pan are dark brown. I have made ghee dozens of times and often look at how dark the browned bits are and wonder if I’ve burned it, but it’s never happened. That’s not to say it’s impossible to burn ghee, but I wouldn’t worry too much about it! The best way to know if it’s ready is to stay close by and listen–the bubbling quiets down markedly when it’s ready to be strained. You’ll need some cheesecloth for straining the ghee. It’s best to use a fine cheesecloth like butter muslin to make sure none of the milk solids sneak through. I reuse my butter muslin so I don’t have to keep buying it–just rinse it out with some hot water and dish detergent, machine wash it (I throw it in with my towels and dishcloths), and hang it up to dry. Ghee keeps for a very long time, but water can cause it to spoil. 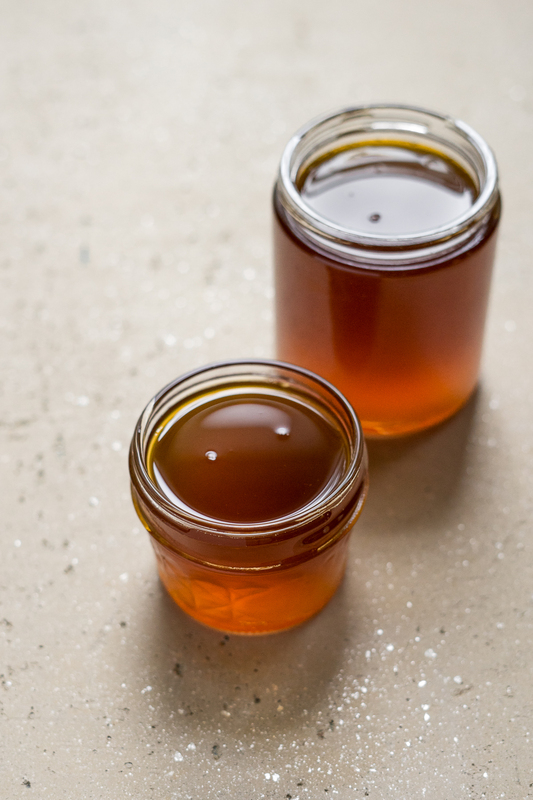 Make sure the jars you pour the ghee into are very clean and dry, and use a clean, dry spoon or knife each time you scoop some out. Wondering what to do with your ghee? Use it whenever you need a high-heat cooking fat for sautéeing or roasting, or anytime you’d normally use butter! Also, just open the jar and take a whiff whenever you need a quick mood-booster. It's so easy and quick to make ghee in an Instant Pot (or on the stove), and it's much more delicious than store-bought! Use your homemade ghee anywhere you'd use butter for more flavor and less lactose. Line a sieve with two layers of cheesecloth, and place the sieve in a large heatproof bowl or glass measuring cup. To make ghee in your Instant Pot, push "Saute" and ensure the heat level is set to normal. Add the butter to the pot and wait. After the butter melts, it will start to bubble, then foam will appear at the top, and then browned bits will appear at the bottom. The whole process should take less than 10 minutes. 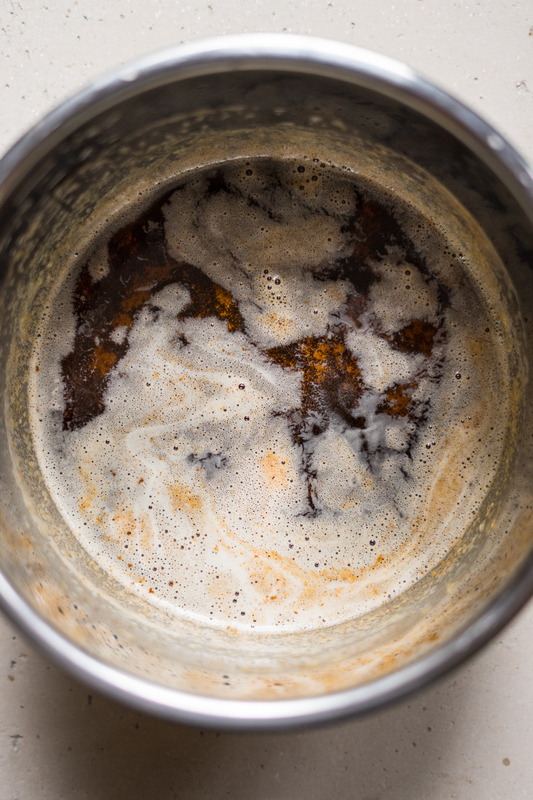 Once the bubbling has quieted down and there are chestnut brown bits in the bottom, push "Keep Warm/Cancel". Remove the insert from the Instant Pot and set it on a trivet. To make ghee on the stovetop, place the butter in a medium saucepan over medium heat. Let the butter melt, swirling the pan occasionally. The butter will come to a boil and you will see foam bubbling on top. After about 15 minutes you should see little browned pieces of milk solids sinking to the bottom of the pan. When those bits are a rich chestnut color, remove the pan from the heat. Instant Pot and stovetop: Carefully pour the mixture through the cheesecloth-lined strainer into the bowl. Discard the browned bits in the cheesecloth*, and let the ghee cool to room temperature. Pour the ghee into a glass jar. 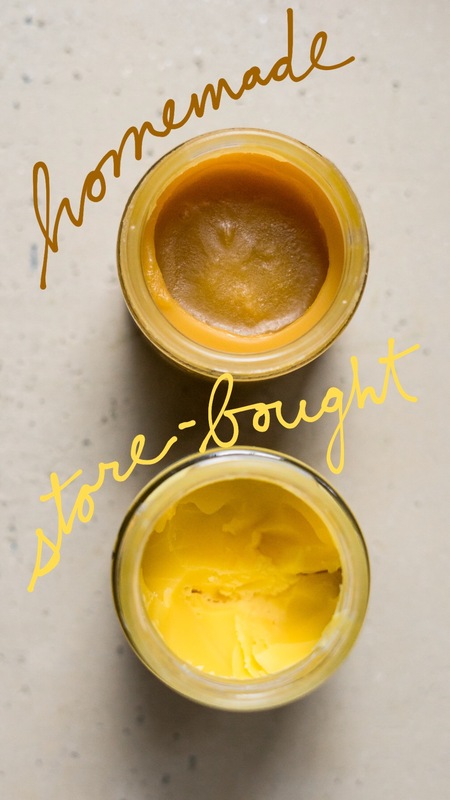 Ghee will keep at room temperature in a semiliquid state for weeks, but I store mine in the refrigerator, where it seems to keep indefinitely, just to be safe. Make sure to use a clean, dry spoon whenever you scoop ghee out of the jar. If drops of water get inside, they can cause the ghee to spoil. 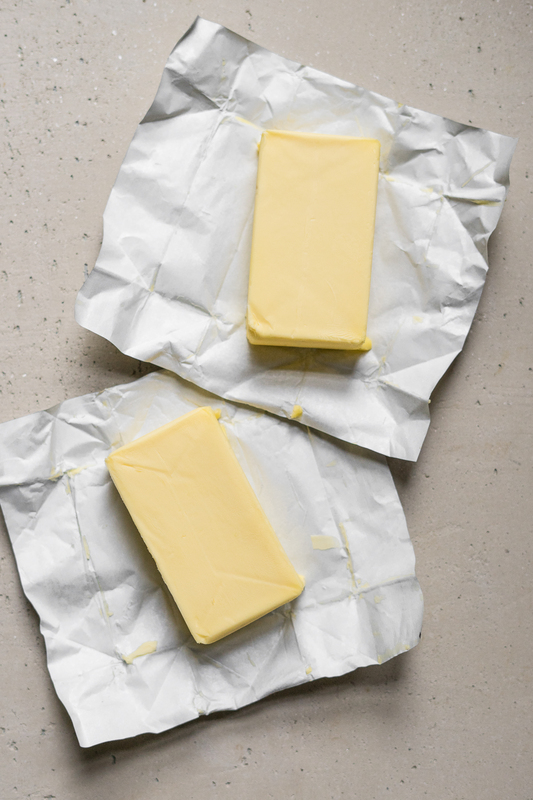 What happens if you use salted butter? It should still work! I think most of the salt will come out with the solids. Love your photos and recipes ! So simple and easy ! Love that amber color. I bet it tastes amazing. MMMMmmmm!!! I could eat ghee by the spoonful because it’s amazing! It’s amazing how simple this is. Yes! Another awesome recipe to try in my instant pot! I’ve been wanting to do this forever! Look at that rich homemade color! Brilliant! I did not know you could make it in the IP. Thanks for sharing. What a great idea that I wouldn’t have thought of, thanks for this tutorial!! Pinned! I’ve only just started cooking with ghee – I buy it in tubs but I imagine it’s much cheaper (and fresher!) to make your own. Will give this a go – thanks for posting! This is awesome! I’ve always just done store-bought and have been secretly kicking myself for not making ghee sooner. Definitely need to action this ASAP! Yum! Ghee is my absolute favorite cooking oil, and that’s so awesome that you can make it in the IP. I’ll definitely have to try this out. Thanks, Jean! It’s my absolute favorite, too. Hope you give it a try in the IP! I use Strauss organic butter to make my ghee – it is the best yet! 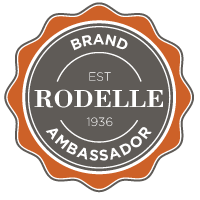 I’ve never seen that brand! I’ll keep an eye out. That chai ghee latte you mentioned is worth making ghee for alone, it sounds amazing and I’ll have to check it out for this weekend’s brunch! Hope you enjoy it! I just love using ghee in hot drinks! !